You love riding your bike and probably spend hours cycling, eating mile upon mile as you build yourself up and aim for further-reaching goals. But do you really know how many miles you have covered and what speed you’ve accomplished? You probably want to start looking for a bike speedometer; to enable you to track exactly what you are achieving, but where do you start? Or maybe you already have a good idea about different speedometers but are still a little unsure. Possibly you have one already and are looking to upgrade or want a newer improved bike speedometer. Whatever your level of expertise or riding preferences; this review of the best ten bike speedometers will provide a varied snippet of the best of what’s on the market today. And if you are looking for one that gives you more advanced readings; for example: average miles and speed, there is one that will fill all your requirements. 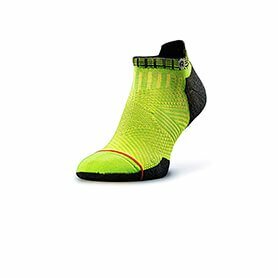 They are offered with a wide choice of features and ‘must haves’ and are a great way to measure fitness levels whilst you are taking part in your favorite pastime. So; from the basic to the more advanced bike speedometer – check this list out before you buy to get a bit of a head-start on the options available. The remaining seven are also good recommendations and each has its own practical and useful features and functions that will put you in full control of monitoring your riding. 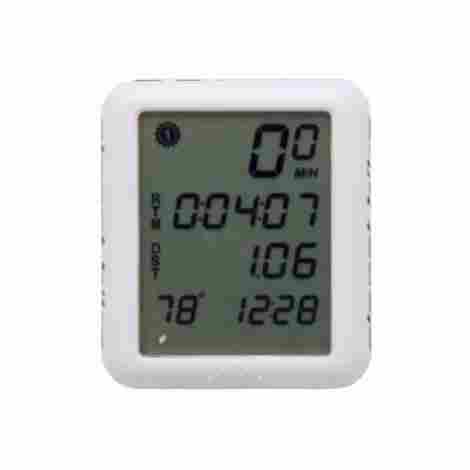 This versatile bike speedometer is offered as an ideal starter computer for those beginning their cycling tracking, it is easy to set up and simple to understand and use. The wired speed sensor adequately tracks useful stats including a clock, total riding time, speed measurements as a current speed, a maximum and an average speed, trip distance and elapsed time, as well as a pace arrow so allowing all the important data to be displayed and stored for future reference. 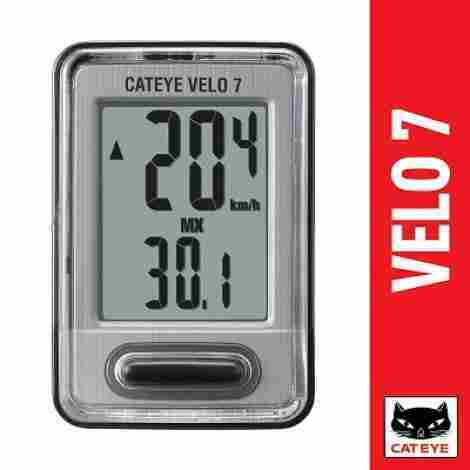 The CatEye Velo 7 is smart enough to know when stopping and automatically stops counting average speed and time. This feature is practical because it takes into consideration those irregular normal traffic stops and doesn’t affect the overall readings. The battery life boasts being long lasting – for up to three years so there is less concern about the requirement of always carrying spare batteries. The programmable odometer is clear and straightforward to use; and it benefits a simple tire sizing feature. Considering the overall benefits this bike speedometer has to offer, combined with the easy set up and functional display, and the added long lasting battery life – it is easy to reflect that both cost and value are very well represented with this set up. Planet Bike offer this bike speedometer as an easy to install and read computer that has a larger than average display for practicality; and shows up to five pieces of information for convenience. It boasts nine handy functions including current, maximum and average speed, trip distance and ride time, temperature monitor, a clock and a dual odometer that is compatible for two-wheel sizes. It comes with a CR2032 battery for immediate usage after setting up and offers a long life between the requirements for battery changes. The Protègè bike computer comes complete with a full mounting kit that includes an eighty-two-centimetre wire for front wheel mounting and a handy handlebar bracket that is complimented with easy to understand instructions so is practically ready to go. The design incorporates a button-less screen so leaves more room for the clear display of data. And for better ease of use the screen is simply touched to operate so reduces distractions and the risk of untimely accidents. The durable and robust design of this speedometer combined with the innovative technology used in its production and the practical, easy to use features ensures that money spent on this is money well spent. 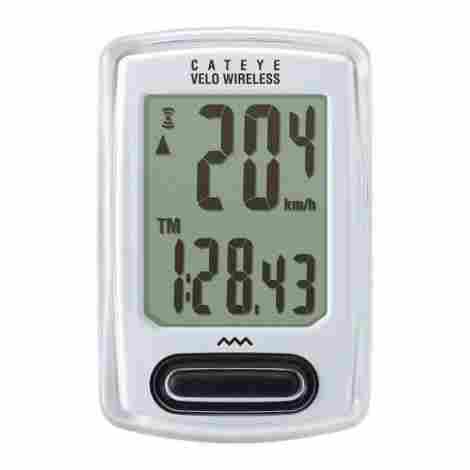 This wireless bike speedometer is available from the CatEye Velo range and has functional features for tracking miles. It includes functions like a clock, a pace arrow for regular monitoring, complete distance travelled, a trip distance function, and elapsed time is also added. Speed is monitored in terms of current speed, maximum speed and average speed for tracking and storing data to enable comparisons and even setting targets for the next run. This computer has a handy feature that tracks the data of total calories burned; and it has a clever automatic stop/start feature that recognises when the bike wheel is not turning and doesn’t begin again until wheel movement is detected. The computer comes complete with a full mounting kit and east instructions for installation, the FlexTight Bracket that is included allows practically instant setting up meaning less time getting ready and more time on the road. The computer is ready to use even in the dark or changing light conditions, a quick press button turns on a brief green back light to enable easy reading no matter what time of day or night it is. The easy to install and use computer comes complete with full, comprehensive instructions. This computer boasts being water proof with the addition of a full rubber ring and sealed body, this improves its overall versatility because there is less concern about being caught out in inclement weather. The great features that come as standard with this speedometer including the functional display screen and the water proofing, equalize the benefits between cost and value and gives overall great value for money. 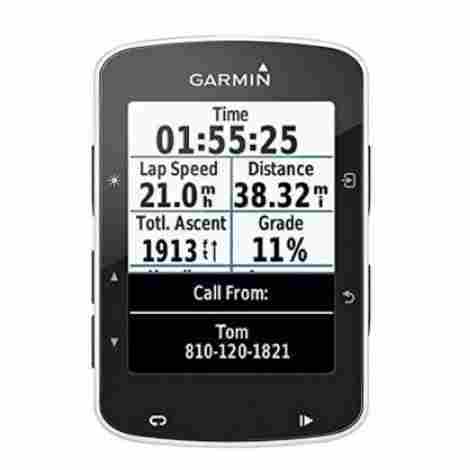 This handy Garmin Edge 200 boasts being completely set-up free and is ready to install and go straight from the packet. The functions it is equipped with benefit with time tracking, number of calories burnt, speed and even location. The unit is quick to use and is versatile enough to be moved between different bikes without the requirement for re-setting. The computer has the ability to store over one-hundred and thirty hours of data for back referencing and comparisons of previous achievements, along with the ease of setting new challenges. The GPS receiver has HotFix satellite prediction enabling so location and journeys are provided with more accuracy, its ability to trace satellites quickly mean there is less time waiting for signals and relays of important location information. The computer has a clever design function that recognises automatically when the wheels are not turning and stops, then restarts when the bike does without adjustment. It also has a unique function that allows specific targets to be set such as distance to improve achievements. The useful and highly practical features that are available with the Garmin Edge 200 combine an accurate GPS system, functional settings and an easy to install and read computer – ensures that overall this is excellent value for money. This bike computer boasts being one of the smallest and lightest computers available on the market, it weighs in at a mere twenty-five grams and this gives it more appeal especially if traveling between rides. It has GPS +GLONASS that enables quicker tracking of satellites meaning more time riding, and it benefits from still being functional under the cover of trees for greater convenience when riding over altering terrains. 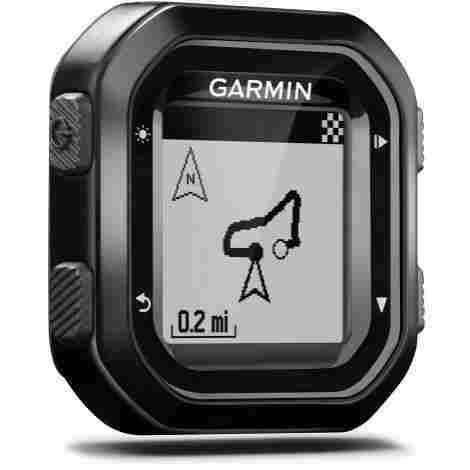 The availability of Garmin Connect allows the download of interesting courses and enables the viewing of personal tracking for analysis. The connectivity increases when the computer is paired with other Garmin devices allowing sharing of live tracking and achievements. For added useful features, pair this ANT+COMPATIBLE computer with a heart rate monitor to check personal health indicators and cadence and speed sensors to retrieve practical data and monitor day to day usage. 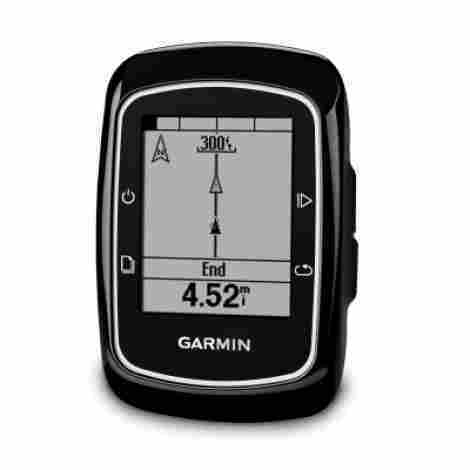 Considering the compact and lightweight design of this Garmin Edge 25, and mix that with the other great features like the possible connectivity and +GLONASS satellite enablement, it is clearly balanced on both the cost and the value it provides. This computer includes features for improved connectivity with automatic uploads, social media sharing, smart notifications, live tracking and even offers the ability to send and receive courses when connected. The inclusion of Strava allows live segment challenges and the GPS provides real time accuracy as soon as it is enabled. The sleek tidy design measures two-point nine by nought-point eight by one-point nine inches, fits neatly onto the bike with little fuss and is practically ready to go as soon as it arrives. The Garmin Edge 520 is compatible with Shimano Di2 electronic shifting systems5 and additional ANT+ sensors, which not only improves its overall versatility but offers a greater range of uses and features when on the go. The aerodynamic computer is technologically improved to analyse data such as correct time zones according to location. Its lightweight design is a mere twelve-ounces and this makes it highly appealing and useful for taking travelling in between rides. The relatively higher price of the Garmin Edge 520 is justified in terms of the technological features that it has, including the mobile connectivity and analysing capabilities; overall this computer is advanced and therefore good value for the price. 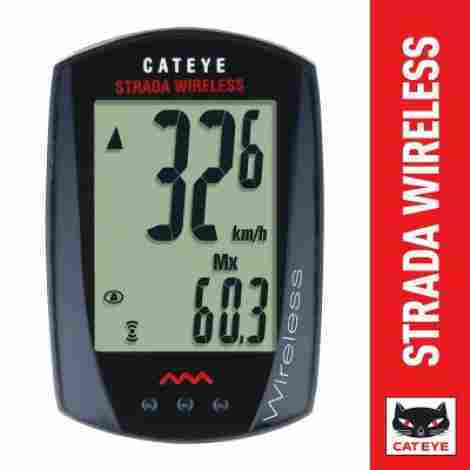 The CatEye Strada wireless has favorable features that include speed shown as an average, as a maximum and as current, it shows full journey distance, a handy clock, real-time elapsed and a useful pace arrow so riding stats can be monitored all along the ride. It benefits from an automatic stop and start feature that doesn’t need any adjustment and simply recognizes the differences, and as a bonus, the time stopped doesn’t get included in the overall stats. It is versatile and is suitable to be used on two separate bikes with the dual tire size application. The computer enables use by simply touching the bottom of the unit – this improves overall safety and means less chance of potentially causing an accident through button switching distractions, and makes checking different data a breeze. The computer comes complete with a Flex Tight Bracket that allows easy and quick mounting time, less fuss installing inevitably means more time to enjoy the road. This easy mounting also acts as an anti-theft addition because it can be removed quickly when stopping for well-earnt rest breaks. The considerations between both cost and value are well reflected and represented in both areas, the ease of use and mounting along with the dual tyre settings, ensure that this is good value and money spent here is money well spent. This bike speedometer boasts a full sixteen function advantage that include speed as a maximum, as an average and as current. It also has a handy speed comparison function for personal analysis. And an average cadence and overall cadence monitor, it has a handy clock, it measures temperature and ride time. It boasts being the ideal training computer and uses Sigma’s Topline 12 product range and allows for programming to increase potential and record achievements on the way. The sleek and smart design is functional without being bulky and heavy. This Sigma Sport 16 function computer also has extra features that will come in handy if trials are a part of day to day cycling, it has a count-down timer and a stop watch so progress and personal achievements can be tracked, checked, compared and stored. The computer has the bonus of a two-tire setting application that is fully adjustable, it boasts being water-tight so means less stress when riding in changeable and inclement weather conditions. The system also has a low battery indicator that can be a real help when out in the middle of nowhere. 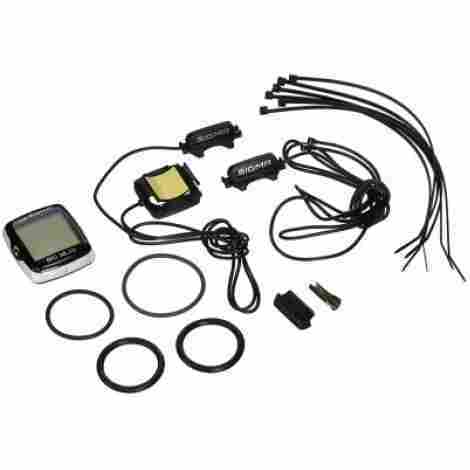 This mid-range bike speedometer and computer is packed full of practical and functional features that are designed and put in place to assist in training and for hardy experienced riders, the overall value is well matched with the price. 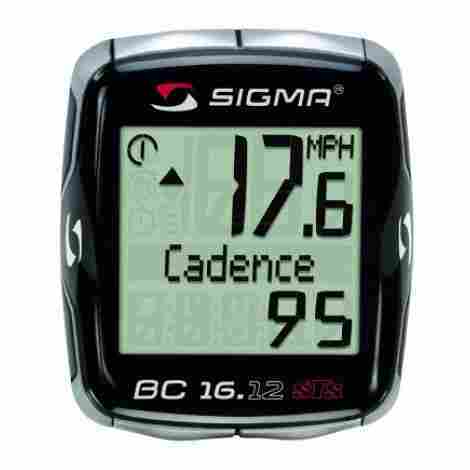 Sigma offer this bike speedometer as a wireless computer that is easy to install and use, and needs no tools for full installation, it benefits from being water-proof as well so reduces the risk of damage when riding in questionable weather conditions. It has a full text and easy to read display and information tracked is downloadable for complete personal comparisons and analysis. It is designed to sit neatly on the center of the handlebars so is readable without straining. The Sigma Transmission System offers a digitally coded transmission system that stops interfacing with other computers. The collection of transmitted data is sent directly to a receiver that is conveniently placed within the computer. The computer is operated through a simple four button operation for ease of use when riding, and the large screen makes it easy to read the data projected. The mount is easily attached and is flexible enough to maintain accuracy on any ride. When taken into consideration the wireless digital encoding offered with this computer, and the ease of use it benefits from; it is justified to say that the balance between cost and value is well represented and this is great value for money. For as long as people have been interested in cycling; they have had a growing interest in measuring their own performance in a reliable fashion that goes beyond regular road signage. In its original form, the bike speedometer was invented by a gentleman called Veeder; who, in 1895 created the first cyclometer. This basic piece of equipment was a simple (but effective at the time), method of counting the revolutions of the bike wheel and converting those rotations through an analogue odometer to miles travelled. The rider was now able to see for themselves a visible count of their own achievements. Of course, as technology has developed along with practically everything cycling related – the original idea has been built on and improved to include much more recordable data. The features on a contemporary model allow you to store and retrieve your data and even set yourself new goals to aim for, the following criteria below are basic information gathering considerations are intended to take some leg work out of your search. 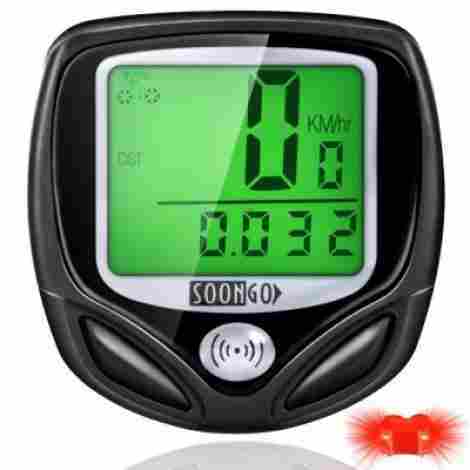 Modern bike speedometers are offered in two main types, being wireless and wired. Both have advantages and disadvantages. For a wireless speedometer; the plus side is the lack of extra connecting wires on your bike that can be untidy and may get caught in other equipment. On the negative side; these styles of speedometer need batteries in the head unit and the transmitter – which ultimately means either changing your batteries before every ride or having to carry an extra set when you’re out and about. One other thing to think about here is the fact that wireless bike speedometers do sometimes lose their signal; (and although it is thought that any data will still be saved during these off periods), this is potentially a risk so it may be a good idea to always have backup when you’re riding in the middle of nowhere. For wired speedometers this extra set of batteries may still be relevant, albeit the requirement will be halved. The wires can be messy, can break or become loose or unattached and that won’t be functional especially if you’re on a longer ride. Wired are considered more reliable for the serious rides in the middle of nowhere, they are more economical and if you use rechargeable batteries they are even more cost effective and reliable in the long run. If you’re planning your cycling around the weather; you will know it’s not always certain if you’ll be caught in the rain. Any level of precipitation can be a possible cause of bike speedometer malfunction; but you can check the levels of water resistance your new speedometer can offer by checking the IP Code. Better to be safe than sorry, the last thing you want is to be caught in the middle of a summer or winter downpour in the sticks to find that your expensive bike speedometer isn’t water proof at all. It is the digit on the code you should be more aware of because each number indicates a different level of resistance. From 1 which offers protection against vertical dripping water, up to 5 for protection against water jets and even up to 9 for high pressure and warmer water jets. Additional letters M and S indicate moving devices in testing or standing devices. As ever though, it is always better to have at least an idea of the weather conditions or implications that you are likely to encounter on your rides, being properly prepared is half the joy of planning and executing a fulfilling and exhilarating ride. On regular mediately priced bike speedometers you will find some standard features that may include some of the following; speed: this can be broken into your current speed, it can show and/or store your maximum and average speed, it can measure the overall trip distance; which is great if you like to plan ahead and beat your own times or hours spent on the bike, ride time, (for when you’re actually moving), cadence is shown to represent how fast your legs are turning, the clock so you know where you are in the day and an odometer for a visual on your total distance for the stint you are on or have just completed. More advanced features can be found on some higher priced bike speedometers, you can monitor your heart rate, including your average and maximum beat, your altitude – high point and in real time, the ascent is measured as well as descent and finally a temperature. These indicators are input to help you get the best out of your riding, they can aid your increasing test levels if you want to better your times or speeds, and when used properly can be a very useful and informative part of your cycling routine. All these features are fast becoming more standard, but if you are always best advised to check your favorite speedometer has the specific features you require. For more advanced bike speedometers you can also find them with smartphone pairing feature; to enable you to keep a track on your past and present rides and even set yourself challenges for future rides. And a great new advantage is the addition of GPS on the speedometer so you need never lose your way again, this is a great way to save the battery life on your smartphone and reduces the need for carrying paper maps. These features also allow you to keep your phone safely tucked away and allows you distraction free riding without fear of dropping your phone or taking your eye off the ball to check it. You should check the installation requirements for the safe and reliable fitting of your bike speedometer, most should come with fittings and brackets etc included in the pack, don’t be tempted to use kits that are not provided because they can cause damage to your speedometer or may even not be adequate enough to hold it in a secure position – especially if you intend to ride on rough or uneven terrain. Careful attachment of the sensor is important too if this is done incorrectly; you won’t get reliable readings if you get any at all. Be sure to put your computer in a suitable place on your handlebars so it won’t obstruct your movements or view of it when you are riding, and it is good practice to cable tie the wires to your frame to prevent catching and breaking. Placing the magnet sensor on your wheel in the right place is vital too – this will relay the rotation and allows the correct calculation to be achieved. Finally; the computer needs calibrating to your specific bike, this is usually easily implemented by inputting the tire size into the computer, so it is able to collate, calculate and display the correct information. This basic guide will hopefully give you enough background to get you started on your hunt for the perfect bike speedometer, the range of considerations is as individual as your own preferences and the information collated is aimed at pointing you in your own direction. At the end of the day, as long as you are happy with your product, you can go forth and enjoy your cycling for a long time to come. Happy and safe riding! Q. Are bike speedometers easy to install? A. Yes, they are pretty straight-forward to install and get going, and each one you buy will have detailed instructions included with them. As long as you place the computer is a safe and easily read position, place your magnet sensor and calibrate it to your tire size it will be up and running in no time. If you are in any doubt, always seek the advice of a trained professional to make sure it is fitted and working properly. Q. Are all bike speedometers water-proof? A. Not necessarily, each one will ideally have an IP rating stated on its individual specification leaflet, the digit in the IP code is the key to how water-proof or water-resistant your speedometer. The higher the number the higher the level of resistance or proofing it has, be sure to check though because the last thing you want is to be caught out with a lower IP and risk flooding your new speedometer. Q. What is the difference between a wired speedometer and a wireless one? A. They both perform the same way, in that they show speed, ride time etc; but the two fundamental differences are in the setup and maintenance. A wired speedometer has the requirement for only one set of batteries in the computer itself and the wires need thoughtful placement and ties to make sure they don’t tangle and hinder your riding. A wireless requires two sets of batteries without the considerations for the wire, and they occasionally lose transmission, but all data is usually still saved. So; the main differences are the wire, and the requirement for different amounts of batteries you carry. Q. Does the size of my tire make a difference to the type of speedometer I need? A. Not really no; the sensors are designed to go directly onto the spokes. One point, however; if you have flat carbon spokes you may need to check your favored speedometer to ensure the sensor will fit properly to give you accurate readings. Q. Can I take the computer screen off when I leave my bike for rest breaks? A. Most modern bike speedometers will be easy to slide off when you aren’t staying with the bike, this feature is designed to reduce the losses that many riders incur from opportunists. Q. Once I’ve set up my speedometer, does it turn off or ‘sleep’? A. These work on the same principle as a watch, once they are set up and ready to go they don’t usually have an off function. They still continue to work for a substantial amount of time, but you should always check your specific products information to see if this is the case or not. Q. What is the difference between an odometer and a speedometer? A. An odometer measures the distance you have traveled and records how far you have ridden for, and a speedometer can measure the speed you are traveling. Most speedometers have the functionality to save, compare and set new targets for yourself which can be a useful training benefit.